The OpenScape 4000 CSTA is a Unify product that allows to connect the ECSTA to the OpenScape 4000. The OpenScape 4000 CSTA is the successor of the HiPath CAP Inside V1. The middleware is integrated into the OpenScape 4000 V6 (Scenario 1) and does not require a PC installation. For connecting a OpenScape 4000 V5 or lower the middleware will be installed (stand alone) on a PC. The Application (ECSTA) identifies itself using an Application-ID. The Application-ID can be configured in the ECSTA connection options. In the OpenScape 4000 CSTA Administration you can configure an appropriate license option for this application. When using a OpenScape 4000 V6, the OpenScape 4000 CSTA is integrated into the PBX system and does not require a PC installation. The OpenScape 4000 CSTA is configured on the the PBX system. When using a OpenScape 4000 V4 or V5, the OpenScape 4000 CSTA must be installed on a PC. 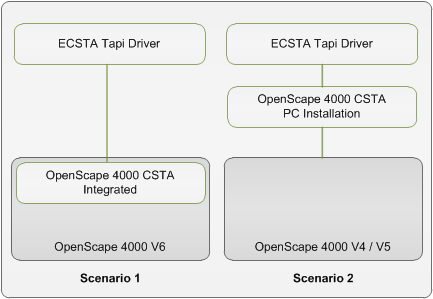 The installation and configuration of the OpenScape 4000 CSTA is described in the document 'OpenScape 4000 CSTA V1 Installation and Problem Determination Guide'. It can be found in the Internet. The Software OpenScape 4000 CSTA requires a license if more then 10 lines will be used. The licensing is configured for each application in the Web based Administration. In the Web based Administration add a new application. Enter the name (ECSTA) and the TCP Port (Default 1040). The ECSTA connects to the OpenScape 4000 CSTA during the lines are read out and as soon as a Tapi line is opened.